Joy Green-Marzichi Lenzi has naming a wine after her twin sister Eva Green. The wholly unofficial term “Super Tuscan” was once a convenient media catch phrase to sell expensive, non-traditional blended wines like Sassicaia, Tignanello, Solaia and Ornellaia, and it worked well until anyone and everyone in Tuscany started to call their wines Super Tuscans, even though the best vineyards were already owned by producers like Antinori, Ruffino, Frescobaldi and a few others who now shy away from the term. The Italian government hasn’t made things any simpler, at first prohibiting the iconoclastic new wines from carrying anything but a designation of “vino da tavola” (table wine), then, in 1994, coming up with “I.G.T.” (typical of the geography), for such wines. 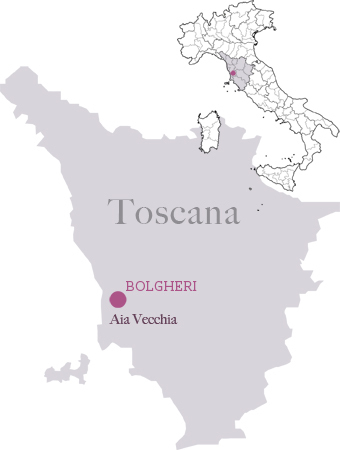 Some of the most illustrious of the original Super Tuscans were from the region of Bolgheri, south of Livorno in western Tuscany near the Tyrrhenian Sea. Not least among them was the Bordeaux-like blend Sassicaia, which was at first simply labeled “vino da tavola” in 1968. But in 1994 both Bolgheri as a region and Bolgheri Sassicaia received a legal designation of denominazione controllata d’origine (DOC).